The first-year seminar ENGL 53.10: “Immigrant Women Writing in America” provides students with the opportunity to reflect on their own experiences through film, novels, short stories and poetry. English professor Melissa Zeiger offers the class to all students, but caters the literary content of the first-year seminar toward the goal of helping first-year students establish their skills as writers and find their bearings in their new college environment. The musical stylings of the Dartmouth Glee Club will once again grace Rollins Chapel this Sunday as they reimagine the works of Felix Mendelssohn and Johannes Brahms. The Dartmouth Symphony Orchestra, accompanied by acclaimed flutist Luciano Tristaino, will perform its annual fall concert at the Spaulding Auditorium in the Hopkins Center for the Arts on Saturday. For many, storytelling represents an escape from reality into a world of fantasy. 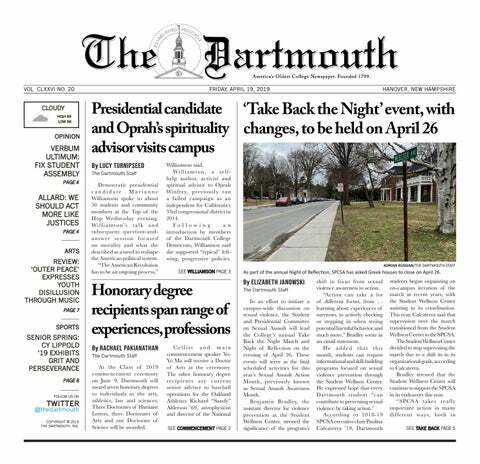 Dartmouth’s isolated location and idyllic campus can often feel like a haven from pressing social issues, lulling students and faculty into complacency. The Emerson String Quartet returned to the Hopkins Center for the Arts Sept. 30, bringing to Dartmouth adaptations of music from 18th century Beethoven to emergent 21st century composers.